I am pleased to inform you all that the annual Medical and Healthcare Camp at Pendakhale, Kolhapurorganized by Shree Aniruddha Upasana Foundation, Dilasa Medical Trust and Rehabilitation Centre, Shreeguru Upasana Foundation and its other sister-organizations was concluded yesterday in a grand manner. This was the 11th consecutive year of organizing this Medical and Healthcare Camp; in my view, probably the one of its kind in India, for the sheer uniqueness of the concept and format. After the camp came to a grand closure last evening, our volunteers who had come from different parts of India and from abroad also left for their respective destinations at around 8:15 pm, after performing their sevas. In a day or two, I would also be publishing the statistics of this mega-event, which has created new records every year, only to be broken in the next year. 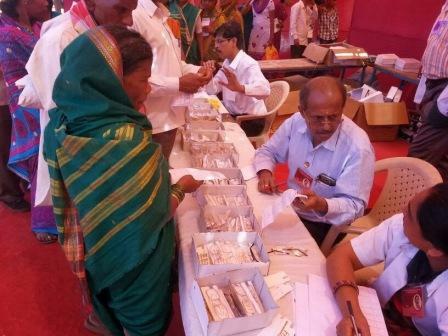 Like every year, this year too, Param Poojya Nandai and Param Poojya Suchitdada themselves presided over not only the actual conduct of the Kolhapur Medical & Healthcare Camp but also its preparations. I have already been uploading the photographs and videos of all the events, including not just of the designated two days of the Camp, but also of the day prior on my Facebook and Google Plus Page and profiles. This year too, the first day featured distribution of items of personal-hygiene, utensils and clothes to the needy families and toys to children. It was followed on the second day by detailed medical examination, diagnoses and treatment of the needy locals. Here. I am extremely glad to mention and elaborate that the distribution of medicines to the needy patients was extremely well organised by setting up a pharmacy at the Camp venue itself. Also, an elaborate, neat and well managed general OPD was set up, for treating dental, orthopaedic, ophthalmic and gynaecological ailments and also to conduct X-rays and ECGs.